I didn’t see the end of RAW on 1/2/2012 because I was disappointed by Chris Jericho’s return so I upheld my long running tradition of not watching the main event if John Cena or Randy Orton are involved. Instead I read a report of the main event and decided to track down the ending of the show and watch it as I was curious how it actually played out. One of my new year’s resolutions was to complain less when I write about wrestling. Well, like my resolution to take up smoking and drink more, I’ve already broken my resolution. I have no problem with the Kane/John Cena angle even if I don’t understand why Kane and Mark Henry would be teammates in tag match. 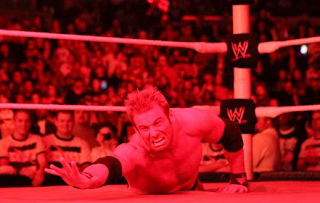 I have no problem with Kane skipping out on the match only to come up through the ring after the match was over. What I do have a problem with is how ridiculous the announcers sounded and Cena’s reaction to Kane trying to drag Zack Ryder into the hole. To hear Michael Cole talk about Kane dragging Ryder into the abyss you would think we would never see Zack Ryder again. John Cena jumped for his life to reach Zack and pull him out of the hole before loosing his broski to the Big Red Machine. 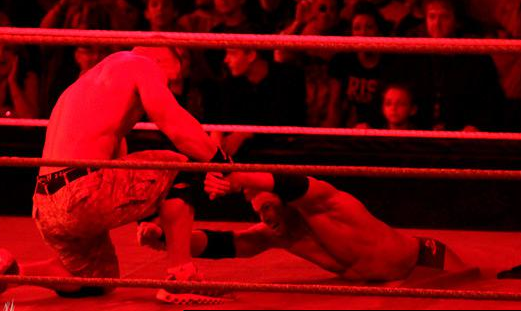 Here’s a question; why didn’t Cena go under the ring from the sides to get to Kane? Were there too many tables, garbage cans and sledgehammers in the way? Or why not wait until the show was over and help the ring crew take down the ring? Maybe he’d find Zack, Kane and Hornswaggle sitting around playing cards. I can suspend belief in wrestling. I’ve given up trying to understand why Triple H cups his hand over the end of the sledgehammer when attacking opponents instead of just swinging the hammer like he’s Albert Pujols. Or why Big Show doesn’t just punch out his opponents in the first five seconds of every match since he’s punch his so deadly. But what I don’t like is when the actions are presented in such an over the top manner. Now, had Kane succeeded in dragging Zack Ryder into the hole and the firebomb went off, I could understand Michael Cole and Jerry Lawler being mortified and wondering what happened to the Long Island Lothario. Simply going crazy before Kane was dragging Ryder four feet to the floor is a bit overreaching. Here’s my plea to wrestling commentators and promoters, please don’t insult the intelligence of your fans. I understand you’re telling a story and at times it’s necessary to go a little overboard. But when you go so far over the top you enter the battlefield of parody, you’ve gone too far. The best stories are rooted in believability. Okay, with that out of the way, no more nitpicking for at least 24 hours. Share your thoughts and opinions on Facebook and Twitter. Be on the look out for cool My123Cents merchandise in the coming weeks.